See that antique couch in the thrift store, the one with stained cushions and a hideous retro pattern? It’s the perfect shape, the perfect size, and the wooden legs match your living room fireplace like nothing has ever matched anything before. You don’t have to spend a ridiculous amount of money on an upholsterer—you can create a household treasure all on your own. Amanda Brown believes that one-­size-­fits-­all furniture makes for a dreary, unfitting living room that drains energy rather than provides comfort and familiarity. 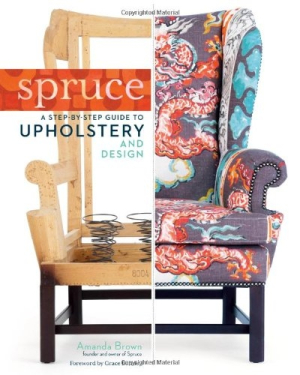 In Spruce, she shows DIY­-ers how to make design decisions—like selecting fabrics based on practicality, functionality, and aesthetics— and how to transform undesired items into coveted collectables. Featuring six projects—Louis chair, pair of “slipper” chairs, wing­back chair, three-­seater couch, ottoman, and several types of pillows—Spruce traces the step-­by­-step process of upholstering furniture of any shape, progressing from simple frame to completed product. As the instructions evolve, followers-­along can experience Brown’s imagination taking shape through detailed photographs. While the dozens of intricate steps per item may seem intimidating at first glance, these pictures convey exactly how each step is performed and how it contributes to the process. Brown does more than simply relay the steps to reupholster furniture (which resemble works of art more than just chairs)—she explains why each step is necessary and why she chooses one technique over another. The forty-­page appendix details specialty equipment and materials, providing readers with all the tools needed to turn a piece with potential into a piece to be proud of.